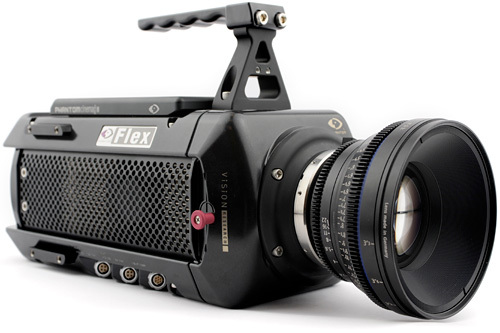 Phantom Flex Can Capture 1920×1080 HD At 2,800 FPS | OhGizmo! It’s toys like this that make me miss attending the NAB broadcast show going on in Las Vegas right now. (It’s kind of like CES, but none of the electronics are consumer friendly or affordable.) Vision Research’s latest high-speed digital camera, the Phantom Flex, is targeted towards the digital cinema market since it features a 4K, 2560×1600 CMOS sensor with 12bit color depth. At maximum resolution the camera can capture up to 1,560 frames per second, and up to 2,800 when stepped down to HD res, though an HQ mode is also available which boosts image quality but reduces frame rates to 780 and 1390 FPS respectively. And if you were to take the resolution all the way down to 640×480, you’d be able to record at 6,300 FPS to capture every last particle of that apple you just shot. For low-light situations, or when capturing footage at high speed, the camera can be boosted to 1,000 ISO to compensate, and it’s compatible with 35mm, 16mm and 2/3″ lenses from the likes of Canon, Nikon and Panavision to name a few. There’s no word on pricing at this time, but odds are if you have the need to capture 4K footage at over 1,500 FPS, I’m sure you’ll find room in your budget for one. The shape and design looks very comfortable. Who wants to buy me one?